Among the issues raised during the Philippine presidential elections in 2010 was the persistent and widespread graft and corruption in government. Candidates had to present their platforms and emphasize how they were going to address graft and corruption in the various agencies in all branches of government (executive, legislative and judicial). The slogan of one candidate was “Sipag at Tiyaga,” which translated into “hard-working and persevering.” A play was made on this, transforming the slogan into “C5 at Taga,” referring to the road and an allusion to someone getting a cut (benefited) from the funds. The allusion, of course, was to the same candidate. Objectively speaking, however, the extension of the road made sense because C5 practically terminated at the South Luzon Expressway where a ramp connects it to the tollway. However, the project failed to construct a link (perhaps an overpass) connecting the extension to the existing alignment on the other side of the tollway. The following photos were taken during one recon survey conducted by our staff for another development project in the area. 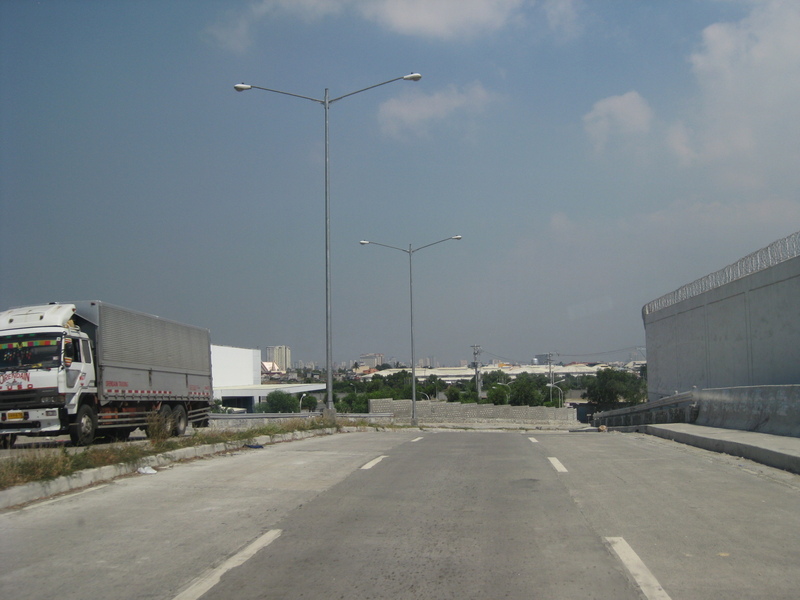 The C5 Extension is accessible from its southernmost end from the Coastal Expressway (aka CavitEx) or Aguinaldo Highway (from Bacoor, Cavite) and the Alabang-Zapote Road in Las Pinas. 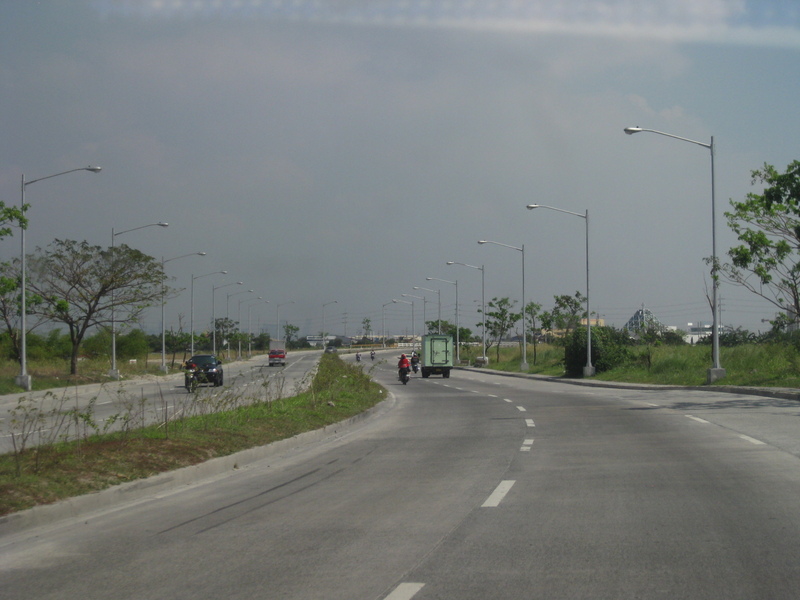 Lane widths and pavement markings follow DPWH standards and the road is apparently well-illuminated given the lamps installed along the highway. The road didn’t seem to follow any particular or deliberate alignment. The vacant lands on either side of C5 extension is allegedly owned by the real estate companies associated with Sen. Villar. However, at the time the photos were taken (early 2011) there were no major developments associated with these real estate companies in the area. There is generally light traffic along the road with few trucks. One can often observe many speeding vehicles including motorcycles. The pavement markings are already weathered despite the light traffic and is probably indicative of the quality of the material used. 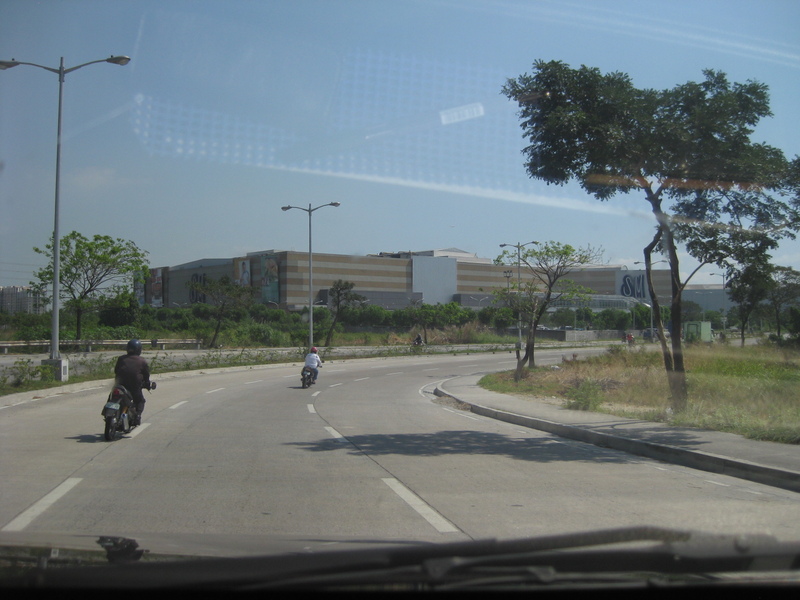 The road passes through a major shopping mall, SM Sucat, where the highway has a junction with Sucat Road. Curvatures along the highway alignment have been interpreted as accommodations for the owners of the lands along the road. Some experts say that such curvature, which can be clearly seen from maps such Google’s are unnecessary. There are 2 overpasses in this photo. 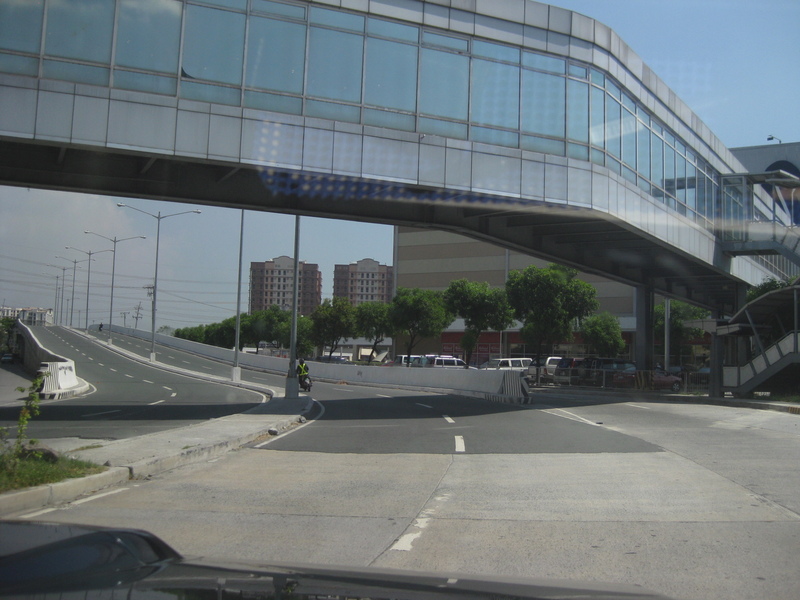 One is a pedestrian overpass for the mall, which has two buildings on either side of the highway. 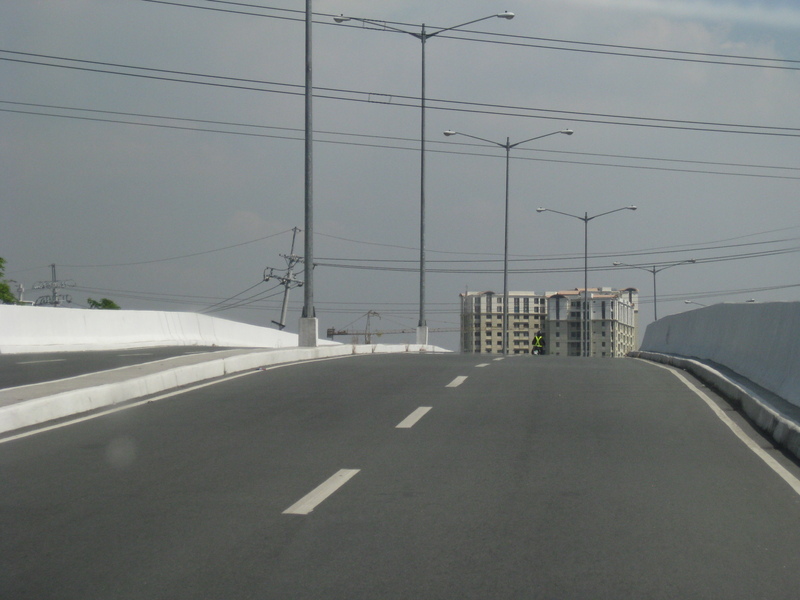 Another is a vehicular overpass (flyover) at the highway’s intersection with Sucat Road. 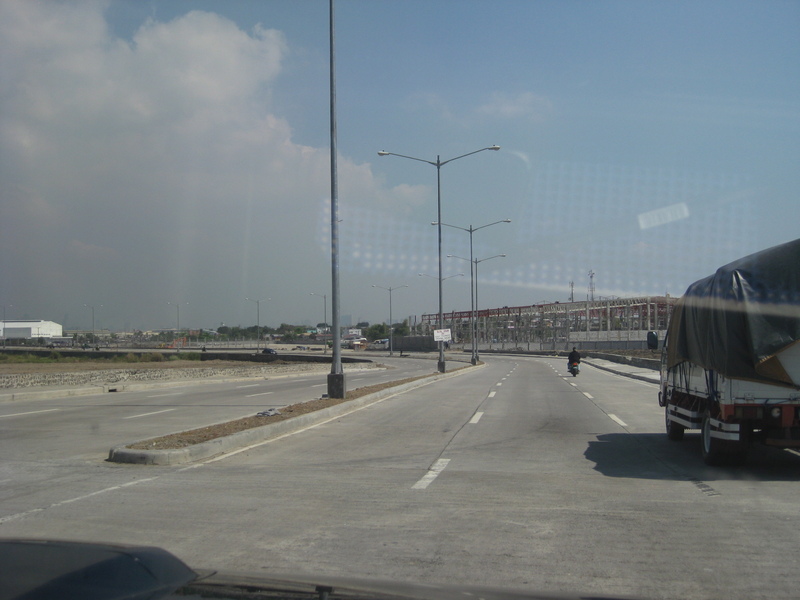 There are service roads on either side of the main alignment for vehicles traveling between C5 and Sucat Road. Visible in the photo (center) are residential condominium buildings of a major developer. The vehicular overpass does not include pedestrian sidewalks or access. Such are actually necessary considering facilities like this flyover should not be for motorists only but for other travelers as well. 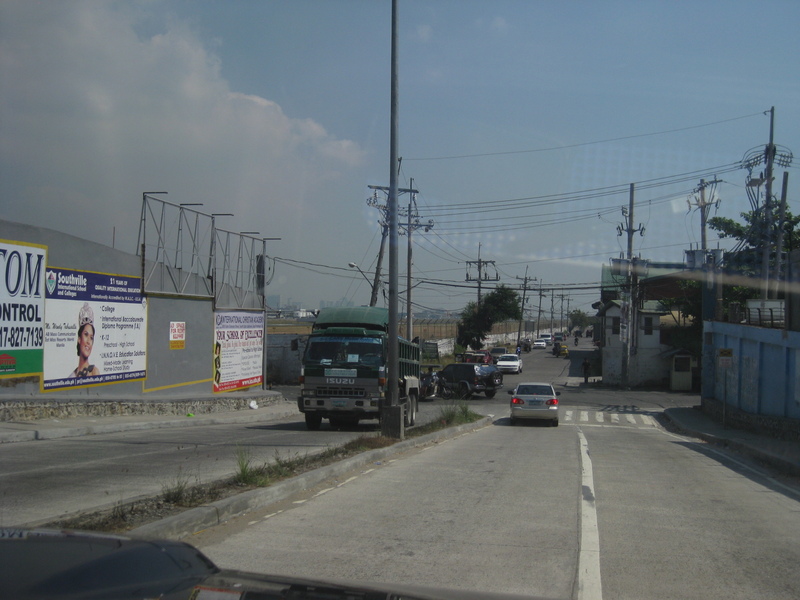 Seen from the northbound-side of the overpass is a wide area used by the El Shaddai religious group for their activities. These areas are usually seen by passengers of aircraft approaching NAIA from the east as these are along the flightpath to the main runway. Section approaching an area where there are mostly warehouses and logistics facilities. This area is already very close to the NAIA complex. 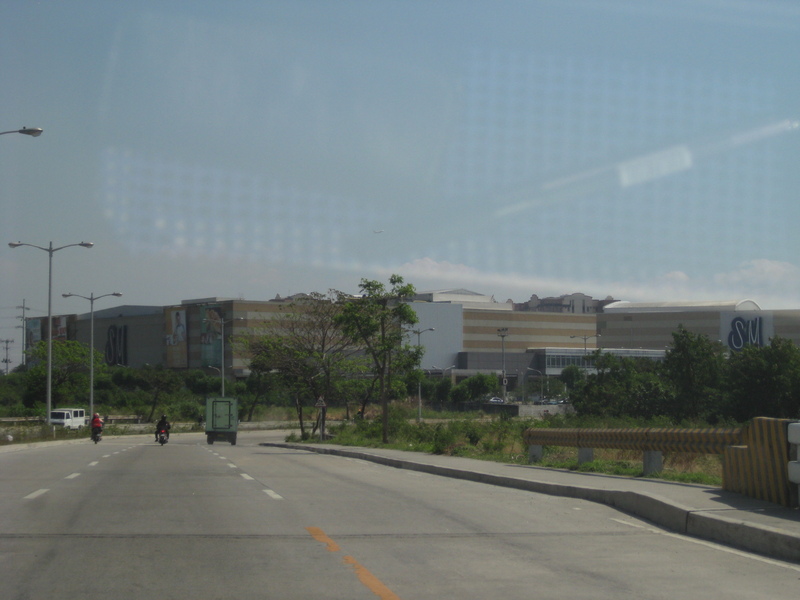 Among the logistics facilities in the area is mall giant SM’s warehouse facility. Note again the curvature along the highway alignment despite the fact that there are practically no developments in the area even after a significant time after the extension’s completion. 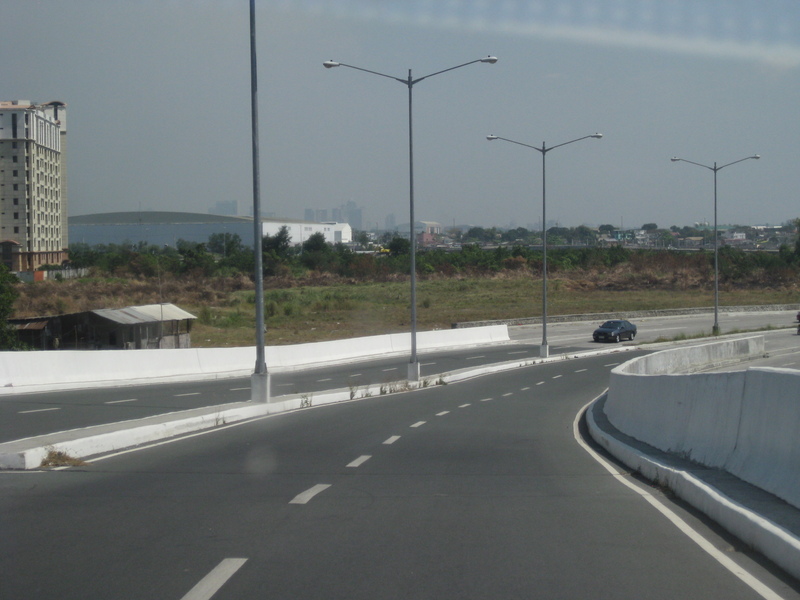 The highway eventually turns towards Kaingin Road and NAIA (also SLEX, which is at its northernmost end). 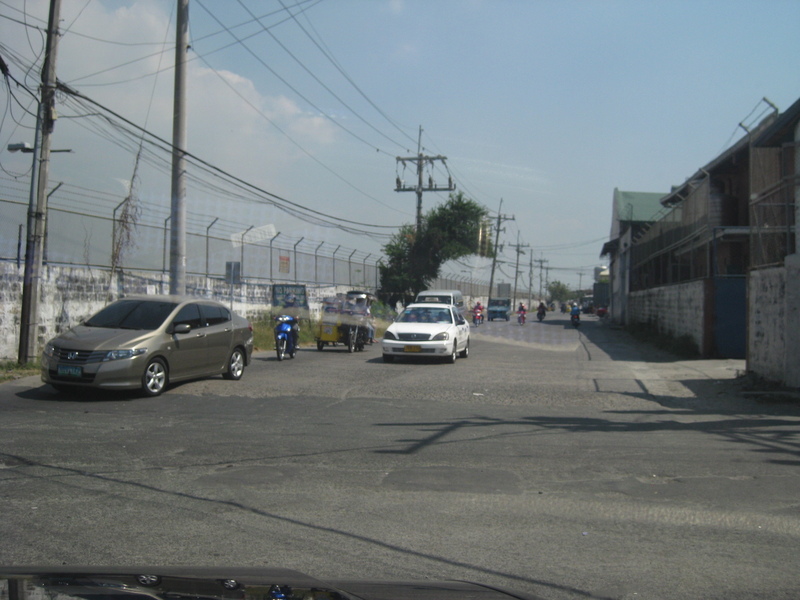 The vehicles turning left are bound for the Airport Road via the road fronting the Multinational Village at the end of NAIA’s main runway. 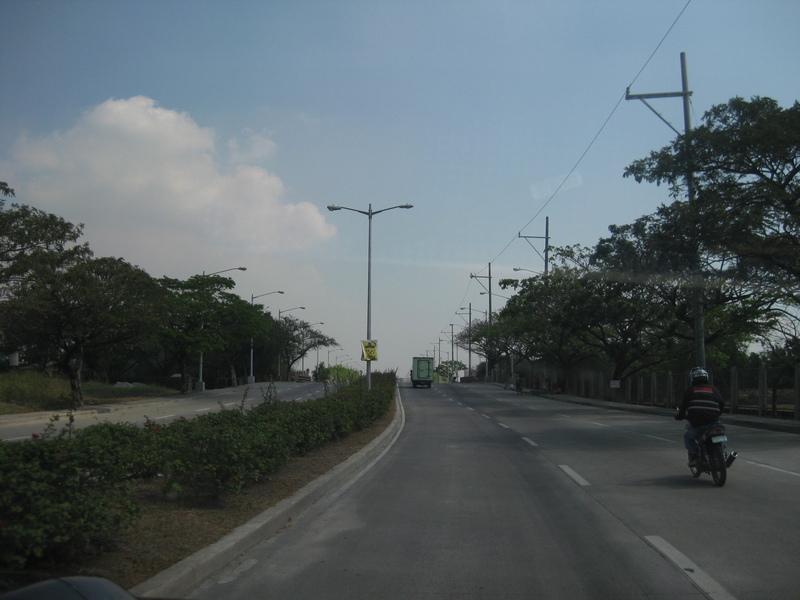 Straight ahead is the Kaingin Road that connects to the Moonwalk/Merville Access Roads that end at the West Service Road along SLEX. 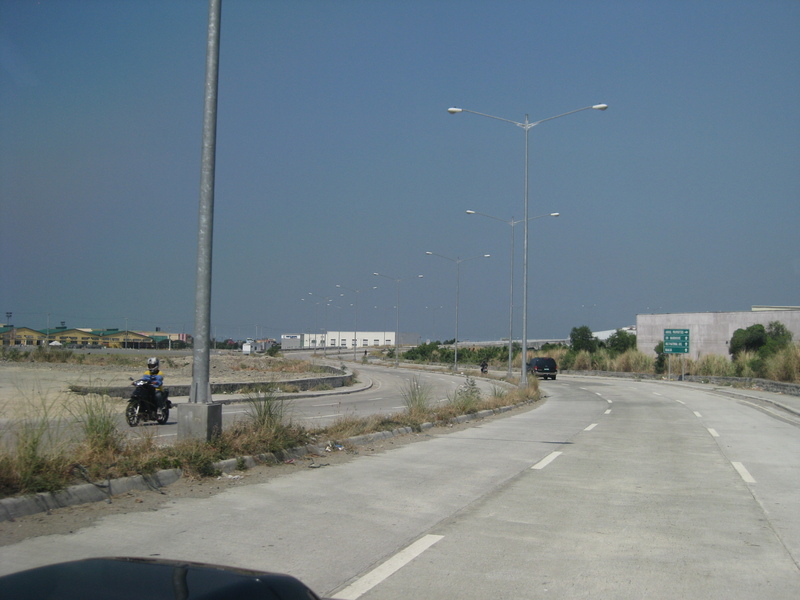 The C5 Extension’s other end starts from Kaingin Road, which is parallel to the NAIA main runway. 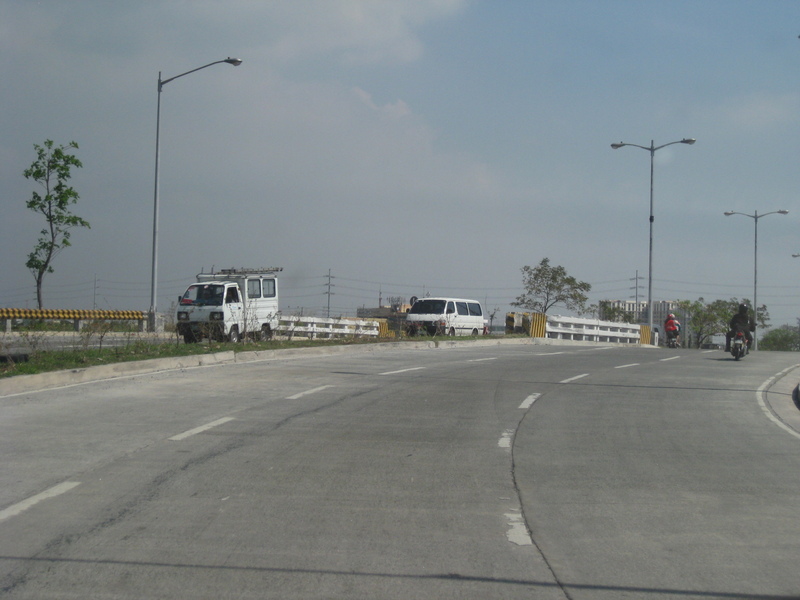 The fence on the left is NAIA’s and there is no physical connection between the Extension and C5 across the SLEX. By d0ctrine in Highways and Streets, Infrastructure, Land use on February 2, 2012 . I’m just curious if the rest of C5 extension going to SLEX is getting developed or has the project been left. It will be a nice route if it really goes all the way to West Service Road and even cross over to C5 on the other side of SLEX. It will provide good access to NAIA airport terminals 1 and 2 from East of Manila and towards Cavite area. I think making the road winding provides easier access to areas covered. It’s a pity that the government did not provide more and wider access road between major roads such as Sucat Road and Alabang Zapote road (except at SLEX/service road and CAA road or J Aguilar Ave.). In between passes through private subdivisions. Likewise between Dona Soledad and Sucat Road (except going through narrow road that the subdivisions in the area opened). There were plans for an overpass bridging east to west but it would have been at the 3rd level because of the existing Skyway. This presented a major issue due to the aerodrome’s restrictions, which requires that specific area to be free from obstructions. As for the roads in the south, there should be some improvements soon as the Daang Hari project gets underway. That project was bidded out early this year but unfortunately has been delayed, too.